Live aboard sailors love their boats. This isn’t to say that sailors don’t also love their boats, but living aboard makes a boat more than just a toy, it becomes a home. 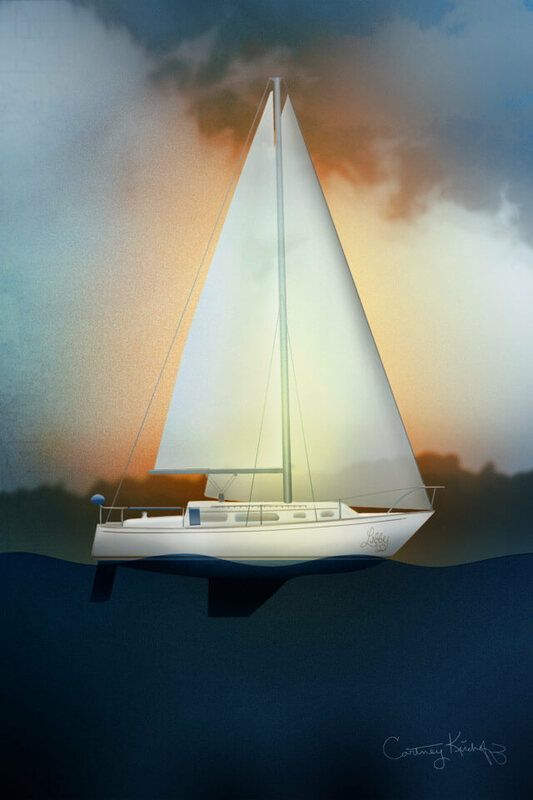 If one spends enough time sailing and living on a boat, the boat takes on traits, projected by the owner, and seems to be an entity. Boats are, after all, referred to as she. When I’d go sailing on my Islander, I spoke to the boat. I’d check the wind and ask where she wanted to go. When I couldn’t get her to point where I wanted, I’d ask, “What are you doing, princess?” If the boat got through some rough waves, hard patches, or was temporarily overpowered, I’d speak to her, give her a pat, thank her for getting me through it. If it was a windy day and I had to go ashore, I’d ask if someone could check the bay to “Make sure my girl is okay.” A live aboard and his or her boat are a partnership. People who do not sail cannot understand that relationship, but it’s really there. Our boats have our hearts. We even name them. Some people identify themselves by what they do for a living, specifically career-oriented people. “I’m a lawyer,” or “I’m a doctor,” or “I’m a fighter pilot.” For career driven people, their job is a huge part of who they are, especially if they’re extremely good at it. Michelangelo the artist, Beethoven the musician, J.K. Rowling the writer. For live aboards, their boat is part of who they are, it is to some extent an extension of their identity. Cruisers are known to other cruisers not by their christian names, but by the name of their boat. The Cambrians, for example. When we hail one another on the radio, we use our boat names. And if we named our own boats, we picked something important to us. The naming of our boats was a careful process. As it was for my sailboat, Libby. Those who know me already know, and a few here have rightly guessed, that the character of Libby, who I named the boat after, was based heavily on me. In fact it’s far eaiser to say what the character of Libby and I do not have in common, than to list the plethora of things we do share. Therefore not only is my Islander 30 sailboat an extension of myself, a part of who I am, I named the boat after a character who took on many of my traits. My boat is personal to me. It seems to me that there are a few people out there who do not understand why I’d be so upset about the loss of my Islander, that I’m making too big a deal out of my home’s demise, that I’ve gotten far too emotional about the ramming of my home, that I should simply “get over it.” People who have boats and live aboard them are able to relate, and for those who do not I’ve tried explaining it above. I can’t help how I feel. I write honestly, and I’ve written about how I feel, as I’ve always done. My boat being hit was not a happy topic, and I’ve not been happy living in my boat since it was hit. I’ve taken action to get the best deal out of it as I could, because in addition to feeling saddened by the loss of my boat and home, I’ve also been angry about it. I explained my situation, my feelings included, and how I got through it, in the hopes that the post may help other people who find themselves in a similar situation. We love our boats and we love our homes. It’s really as simple as that.